Welcome back, Donist World Denizens! For those of you new to our site, I’m Donist, and I am joined by Donist World CFO the Reverse Obie* (my friends’ Boston terrier whose fur recently swapped colors) and by our marketing director / administrative assistant / party planner / working-for-the-weekend puppy Tulip (my dog, Reverse Obie’s sister). Now that we’re back from our vacation and my puppy executive team has forgiven me for Tulip’s trip to the vet, we’re once again working to maintain our status as a Fortune 320,000 company. We’re kicking tail and taking names and ever placing orders with the Taco Guy truck which should be swinging by the corporate office (Mom’s basement) any time now. Hopefully, it won't be much longer until our delicious carne asada tacos are once again in our grubby, little paws. Oh, and that salsa…oh boy! Anyhow, while we pace up and down the hall in anticipation of a tasty treat, have a look at our next batch of comics (see the first batch here) that we love so much we can’t help but come back to them again and again. Enjoy. Take care. Thank you for reading! 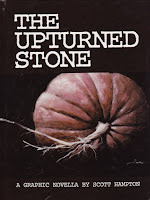 If you’ve been following me for a while, then you have certainly heard me mention Scott Hampton’s brilliant hardcover of The Upturned Stone. In fact, you have probably seen me mention this heavenly treasure many, many times — on six additional occasions, but who’s counting. It definitely bears repeating, because it took me a good long while to learn of the existence of this cross between Stand by Me and Ghost Story with a dash of evil thrown into the mix. Each of the 64 pages of this beautifully watercolored graphic novella manages to both charm and haunt the reader while the story sparks memories of the deep friendships you used to have as well as the things that made you lose sleep at night. I read this Donist World Darling every Halloween season while drinking a cinnamon-rimmed pumpkin ale, a tradition I intend to keep for the rest of my days. Now is the time to finally pick this one up, as the new bargain bin price is now $1.50 per copy if you buy direct from Heavy Metal. I think I’ll order a batch of five to give to friends. If you want to read my original thoughts on this book then jump to this 2013 post. This story is not to be missed. Crud. I guess I’ve been doing this Donist World thing for so long, I completely forgot to go into any sort of detail about one of THE books of the ’80s. I’ll have to remedy that at some point in the future. Anyhow, Miracleman is a book that kind of blew me away back when I was a teen, and it still stands up to the test of time today, but then how could you expect anything different coming from Alan Moore, who soon after stunned the world with his seminal Watchmen series. Miracleman is one of the earliest deconstructions of the superhero and Moore does not hold back. Right from the first issue, you know this is going to be a dark twist to the Marvelman comics of the ’50s, and Moore wastes little time in setting Michael Moran against one of the wickedest villains of all time. One thing I must stress is that you stick around through the third arc, “Olympus,” to see one of the harshest, most vile battles I have ever seen on a comic book page (beautifully illustrated by John Totleben). Neil Gaimen later picked up the reins of the fourth arc and hopefully, after 30 years, Marvel and Gaiman will some day give us a proper conclusion to this monumental series. I remember coming across the second or third issue of Warren Ellis’s amazing The Authority at my LCS and was blown away by Bryan Hitch’s epic, cinematic layouts. I also desperately wanted to know more about the Batman and Superman analogs (Midnighter and Apollo) and the ultra-groovy metal woman (The Engineer). So, after doing a little research, I found out that The Authority is a continuation of Ellis’s Stormwatch where many of the characters were introduced. I rushed out to pick up Ellis’s entire run of Stormwatch so I would be properly prepared for what would become one of my favorite superhero team books of all time. What grabs me the most about this series — besides the thrilling stories and jaw-dropping art — is how these relative strangers with distrust and personal issues begin to grow closer and more like a family as they face threats of massive proportions. If you are looking for an edge-of-your-seat adventure, then look no further than the stunning achievement that is The Authority. Come to think of it, it’s about time for me to take this journey once again. Hey, it’s also a sister book to the heavenly Planetary! Ever since I was a wee Donist I have liked Green Lantern. I had a few action figures here or there as well as a few comics, but I wasn’t what you might call a superfan of the character. I, of course, knew who Sinestro was, but that elongated forehead of his was something that made him look a little…well…goofy. Enter Geoff Johns. While the series was coming out, I kept hearing about how great “The Sinestro Corps War” is and what wonders Johns was putting into the series, so I broke down and bought the Green Lantern: Rebirth collection and I immediately became a Hal Jordan fan. I caught up on Johns’s other GL trades and then dove completely into DC’s grand space opera. Not only was there a Green Lantern Corps, but Sinestro had built up his own army to strike fear into every corner of every universe, creating a very real and thoroughly terrifying threat to everyone. Now, this was enough to have me eagerly whipping through the pages to see what would happen next, and the red ring bearers followed by the rest of the spectrum kept me reading for a good, long while. Green Lantern: Sinestro Corps War is a heck of a lot of fun, and is something I am preparing to soon tackle once again. 45 and His Cronies - Still waiting on ALL of the Stupid Watergate players to lose their jobs and go to prison where they belong.